4: Apply analytic and graphical methods to solve an application. This proven approach helps students gain a deep visual and graphical understanding of math, solidifying a stronger connection to the mathematical world around them. The authors also support analytical thinking with sound pedagogy; chapter layouts, exercises, review questions, and chapter features give students a comprehensive roadmap for success in the course. MyLab™Math is the teaching and learning platform that empowers you to reach every student. By combining trusted author content with digital tools and a flexible platform, MyLab personalizes the learning experience and improves results for each student. Learn more about MyLab Math. MyLab™ Math is the teaching and learning platform that empowers you to reach every student. By combining trusted author content with digital tools and a flexible platform, MyLab personalizes the learning experience and improves results for each student. Learn more about MyLab Math. NEW! Unifying the Function Feature — “Unifying the Function” appears after the introduction of each of the major classes of functions. It provides a concise summary of the 4-step analytic process that drives this text: Analyze the Graph, Solve an Equation, Solve an Inequality and Solve a Related Application.. Each instance of Unifying the Function has a corresponding video and is assignable in MyLab Math with accompanying assessment questions. NEW! GeoGebra® Graphing Calculator and Tutorials — Students can now launch GeoGebra’s online graphing utility from within their MyLab Math course. Look for the GeoGebra icon next to relevant examples in the eText to launch a pop-up version, or download the free app to use while completing assignments. Interactive, self-checking tutorials make it easy to get started with this dynamic tool. Both resources are available within the Graphing Resources tab in MyLab Math. REVISED! Completely revamped Video Program with video assessment exercises check conceptual understanding of the mathematics. NEW! Example Solution Videos engage and support students outside the classroom while covering key topics hand-picked by the authors. Lightboard technology creates a personal experience and simulates an in-class environment. Accompanying assessment questions in MyLab Math make these new videos assignable. NEW! Unifying the Function Videos, by contributor Jessica Rockswold, spotlight the 4-step analytic process applied to each function class and are assignable in MyLab Math. NEW! Question types in MyLab Math include drag & drop, video assessment exercises, Guided Visualization questions, plus Set up and Solve that require a higher level of decision making. Algebra Reviews in the text margins provide “just-in-time” review by referring students to where they can receive additional help with important topics from algebra. Pointers direct students to comments that include on-the-spot reminders and warnings about common pitfalls. Function Capsule boxes offer a comprehensive, visual introduction to each class of function and serve as an excellent resource for reference and review. Each capsule includes traditional and calculator graphs and a calculator table of values, as well as the domain, range, and other specific information about the function. Abbreviated versions of function capsules are provided on the inside back cover of the text. The What Went Wrong? feature anticipates typical errors that students make when using graphing technology and provides an avenue for instructors to highlight and discuss such errors. Answers are included on the same page as the “What Went Wrong?” boxes. Accompanying videos are available in the MyLab Math Multimedia Library. Cautions and Notes warn students of common errors and emphasize important ideas throughout the exposition. 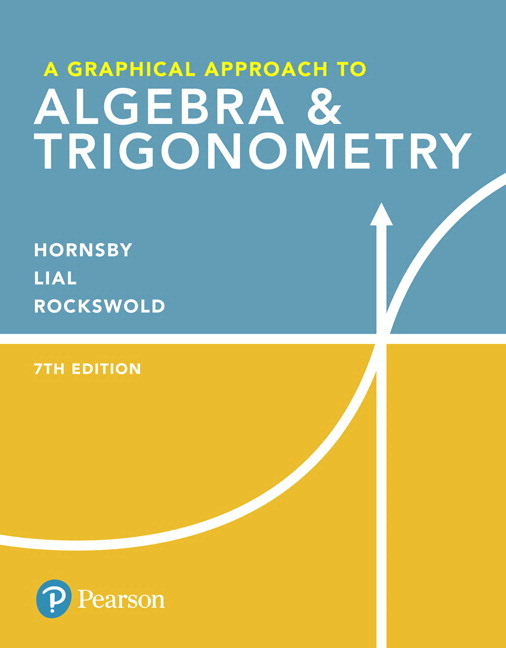 Looking Ahead to Calculus are margin notes that provide glimpses of how the algebraic topics currently being studied are used in calculus. Relating Concepts exercises appear in select exercise sets. They tie together topics and highlight relationships among various concepts and skills. All answers to these problems appear in the answer section at the back of the student book. REVISED! Chapter 3 from the previous edition is now split into two chapters at the suggestion of reviewers. NEW! Data has been updated to increase student interest in mathematics. Some new application topics include organic food sales, video-on-demand, active Twitter™ users, wearable technology, U.S. Snapchat™ users and online gaming revenue. UPDATED! Nearly 500 updated or new exercises have been added. Deliver trusted content: You deserve teaching materials that meet your own high standards for your course. That’s why we partner with highly respected authors to develop interactive content and course-specific resources that you can trust — and that keep your students engaged. Empower each learner: Each student learns at a different pace. Personalized learning pinpoints the precise areas where each student needs practice, giving all students the support they need — when and where they need it — to be successful. Skill Builder offers adaptive practice that is designed to increase students’ ability to complete their assignments. By monitoring student performance on their homework, Skill Builder adapts to each student’s needs and provides just-in-time, in-assignment practice to help them improve their proficiency of key learning objectives. With Personalized Homework, students take a quiz or test and receive a subsequent homework assignment that is personalized based on their performance. This way, students can focus on just the topics they have not yet mastered. Enhanced Sample Assignments by the authors make course set-up easier by giving instructors a starting point for each section. Each assignment, handpicked by the author to align with this text, includes a thoughtful mix of question types (e.g., conceptual, skills, etc.) specific to that topic. Improve student results: When you teach with MyLab, student performance improves. That’s why instructors have chosen MyLab for over 20 years, touching the lives of over 50 million students. Unifying the Function feature appears after the introduction of each of the major classes of functions. 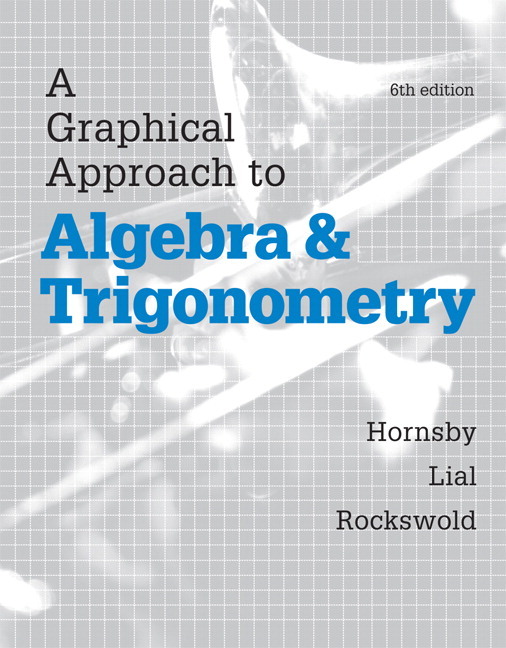 It provides a concise summary of the 4-step analytic process that drives this text: Analyze the Graph, Solve an Equation, Solve an Inequality and Solve a Related Application. Each instance of this new feature has a corresponding video and is assignable in MyLab Math with accompanying assessment questions. Chapter 3 from the previous edition is now split into two chapters at the suggestion of reviewers. Unifying the Function videos were created by contributor Jessica Rockswold to spotlight the 4-step analytic process applied to each graph type: Analyzing the Graph, Solving an Equation, Solving an Inequality, and Solving an Application. Example Solution videos – 270 brand new videos, assignable in MyLab Math, are available to support students outside of the classroom and cover key topics in the text. All section lecture videos have been replaced with up-to-date Example Solution videos for key topics for the 7th Edition. Lightboard technology creates a personal experience and simulates an in-class environment. MyLab Math video assessment exercises check conceptual understanding of the mathematics. GeoGebra Graphing Calculator and Tutorials – Students can now launch GeoGebra’s online graphing calculator from within their MyLab Math course. All resources are available within the Graphing Resources tab in MyLab Math. Question types in MyLab Math include drag & drop, video assessment exercises, Guided Visualization questions, plus Setup and Solve that require a higher level of decision making. *In the AIE, Instructor’s Answers replaces Answers to Selected Exercises. When John Hornsby enrolled as an undergraduate at Louisiana State University, he was uncertain whether he wanted to study mathematics, education, or journalism. His ultimate decision was to become a teacher, but after twenty-five years of teaching at the high school and university levels and fifteen years of writing mathematics textbooks, all three of his goals have been realized; his love for teaching and for mathematics is evident in his passion for working with students and fellow teachers as well. His specific professional interests are recreational mathematics, mathematics history, and incorporating graphing calculators into the curriculum. John’s personal life is busy as he devotes time to his family (wife Gwen, and sons Chris, Jack, and Josh). He has been a rabid baseball fan all of his life. John's other hobbies include numismatics (the study of coins) and record collecting. He loves the music of the 1960s and has an extensive collection of the recorded works of Frankie Valli and the Four Seasons. Marge Lial (late) was always interested in math; it was her favorite subject in the first grade! Marge's intense desire to educate both her students and herself inspired the writing of numerous best-selling textbooks. Marge, who received Bachelor's and Master's degrees from California State University at Sacramento, was most recently affiliated with American River College. An avid reader and traveler, her travel experiences often found their way into her books as applications, exercise sets, and feature sets. She was particularly interested in archeology, and trips to various digs and ruin sites produced fascinating problems for her textbooks, involving such topics as the building of Mayan pyramids and the acoustics of ancient ball courts in the Yucatan. Gary Rockswold has been teaching mathematics for 33 years at all levels from seventh grade to graduate school, including junior high and high school students, talented youth, vocational, undergraduate, and graduate students, and adult education classes. Now retired, he most recently served as professor of mathematics at Minnesota State University–Mankato. He graduated with majors in mathematics and physics from St. Olaf College in Northfield, Minnesota, where he was elected to Phi Beta Kappa. He received his Ph.D. in applied mathematics from Iowa State University. He has an interdisciplinary background and has also taught physical science, astronomy, and computer science. Outside of mathematics, he enjoys spending time with his lovely wife and two children.